Google Stars, the long-rumored bookmarking service from Google, has now publicly launched, but with little fanfare. That Google was working to update its bookmarking service has been known for some time. In May, a developer who had been digging into the service leaked a copy of the “Google Stars” extension, as it was called at the time, while it was still being tested. And now, it seems Google has quietly launched the Stars interface for the “Chrome Bookmark Manager” extension on the Chrome Web store. The Next Web was among the first to spot the release yesterday, noting that the new extension will completely replace Chrome’s old bookmarks interface. After installation, Chrome users are able to save bookmarks with a click, organize them and use Google’s search technology to find bookmarks that got buried deeply in their collections. The extension also eliminates the need for manual organization, if you choose, as it’s smart enough to organize bookmarks into automatically generated categories based on what you’ve saved. The new extension includes social features, too, allowing users to share folders of favorite bookmarks with friends, for example, which is an option that recalls the social bookmarking services from Web 2.0’s heyday, like Delicious or Diigo, for example. And finally, of course, bookmarks will sync across all your devices, as usual. 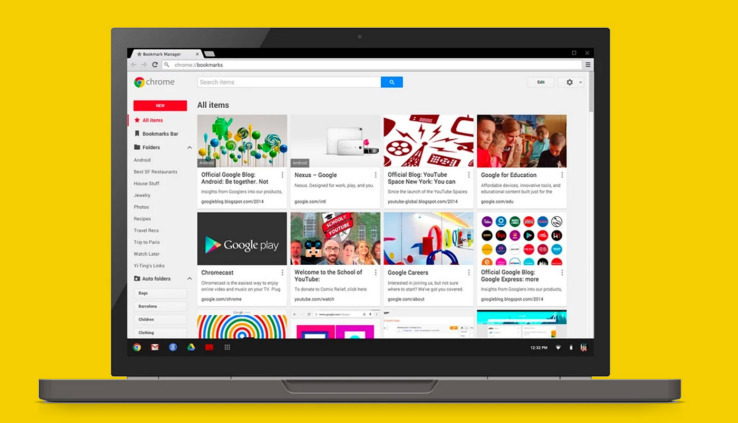 However, for end users, the most noticeable aspect to Google’s Bookmark Manager is the updated interface. No Longer a boring list of links, accessing the “Bookmarks Manager” from Chrome’s “Bookmark” menu bring up square thumbnails of your saved links, which include pictures and descriptions when possible, says Google. There doesn’t appear to be a way to turn this back into an ordered list, so those with larger, unorganized collections may find themselves doing a lot of scrolling. But these users could also take advantage of the “Edit” feature which lets you check off a series of bookmarks in order to quickly move them into another folder or delete them. Some reviewers and other users have reported trouble with the new extension, which may require a more recent version of Google Chrome. It may be possible that this Bookmark Manager is meant to be a public beta given that Google has yet to make an official announcement about its arrival. We reached out to Google for clarification but have not heard back.